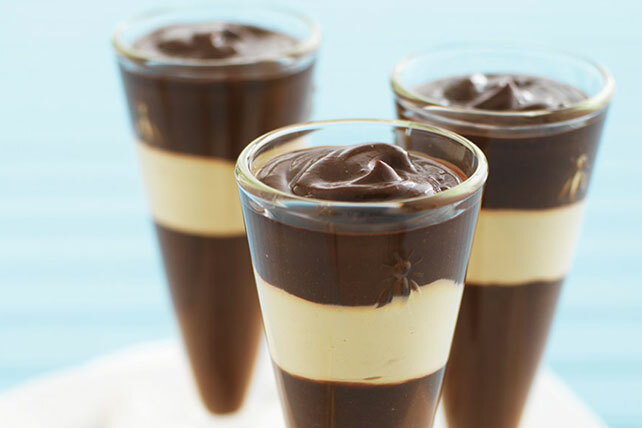 Give 'em something that looks great, tastes delicious and takes just 10 minutes to prepare: JELL-O Chocolate-Peanut Butter Parfaits. Beat pudding mix and 2 cups milk with whisk 2 min. ; set aside. Gradually add remaining milk to peanut butter in medium bowl, stirring with whisk until blended. Stir in COOL WHIP. Save 70 calories and 3.5g of total fat, including 2g of sat fat, per serving by preparing with 1 pkg. (1.4 oz.) JELL-O Chocolate Flavor Sugar Free Fat Free Instant Pudding, fat-free milk, reduced-fat peanut butter and COOL WHIP LITE Whipped Topping.